This chapter presents the results of a study that investigated the differential effects of cooperative versus collaborative instructional strategies and blended versus fully online delivery methods on various aspects of academic community. Measures include the Community of Inquiry (CoI) Survey instrument, individual and group achievement, student satisfaction with process and product, and their value of community. The treatment was a group-work module in a university foundations-level instructional technology course (n=134). Results suggest that cooperative and collaborative strategies in online and blended environments are equally effective in regard to individual achievement, but that blended cooperative learners perform significantly poorer on group projects. Students were equally satisfied with their groups’ process and solution and the group activity did not significantly change students’ value of connectedness. Students did not differ according to their perceptions of social presence and cognitive presence, but significant differences were found in perceptions of teaching presence. The course module design highlights the essential elements typical of design strategy based on typical instructional design processes, while using the Community of Inquiry as a theoretical framework that enables “operationalization” of the instructional design process. The design emphasized teaching and cognitive presence but not social presence. The primary purpose of this chapter is to present the results of a study that analyzed and interpreted differences between online and blended students utilizing collaborative or cooperative strategies for a group project. The focus is to explain the impact of a specific instructional strategy designed for and implemented in both blended and fully online formats that emphasized Teaching and Cognitive Presence but not Social Presence in terms of student perceptions of the CoI framework, student satisfaction, course success (individual and group achievement), and value of and preference for collaboration. 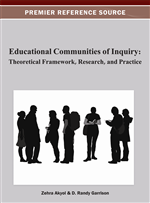 Because the instructional strategy does not emphasize Social Presence, a unique contribution of the chapter is how students’ Community of Inquiry perceptions were differentially affected. A secondary purpose is to describe the instructional strategy and elucidate on some of the underlying aspects of designing instruction: (a) foundational elements that are typical of instructional design processes and (b) Community of Inquiry as a theoretical framework that enables the “operationalization” of the ID process in a particular teaching/learning situation. We use the word operationalize because most ISD models do not include instructional strategies, forcing the instructional designer to look elsewhere for a theory or model to guide development. We believe this brief section to be relevant because, in higher education settings, faculty often rely on instructional design professionals to convert or construct their courses or course modules without significant awareness of the underlying design elements required.